British Gas recently announced they’re increasing their prices by 4%, and with winter fast approaching, homes across the UK will soon be turning on their heating to battle the cold. While this increase in gas and electricity usage leads to larger bills in the winter, there are ways in which you can save energy (and in turn, money). 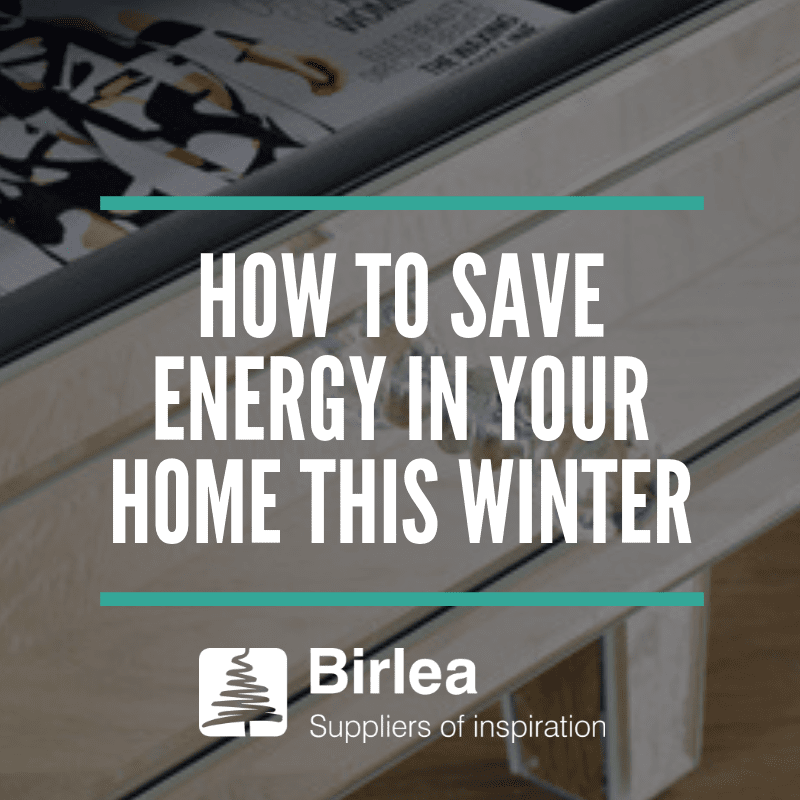 Here, home experts Birlea outline 10 small ways you can save energy in your home this winter, which will help to reduce those dreaded bills. Smart thermostats only warm the rooms you’re using, making your heating system much more efficient. Over time, they learn how long it takes to heat your home, meaning they can ensure it’s the right temperature at the right time. Whilst smart thermometers cost a couple of hundred pounds to install, they can help you to reduce your heating bill by a third, so you’ll soon start to see the rewards. If you don’t want to install a smart thermostat in your home, then you can save energy by turning down your thermostat. Obviously, you’ll want the heating on during the colder months, but by turning your heating down by just one degree, you can save up to £75 a year – and we promise you won’t feel the difference in temperature! If you’re using traditional incandescent lightbulbs, then you may be shocked to know that by replacing them with halogen incandescent bulbs or LEDs, you’ll be reducing your energy consumption by between 25% – 85%. These types of bulbs can last anywhere between 3 – 25 times longer than your traditional bulbs, making them much more effective. Are you guilty of leaving the kettle turned on, or the TV plugged in? Even appliances on standby are using energy, which results in bigger bills for you. Research has shown that turning appliances off at the plug can save you approximately £30 a year – it may not be a huge amount, but it’s better than nothing; and is a step in the right direction to saving energy in your home this winter. One way you can save your energy bills is being smarter about how you use your water: and there are several ways you can do this. When washing up for example, instead of letting the tap run, put the plug in the sink and you could save up to £25 a year. Alternatively, investing in an efficient showerhead can save you £75 a year on your bills. … and of course, choosing to take a shower instead of a bath will see you using less energy. A five minute shower uses approximately 1/3 of water used to fill a bath – so while it’s OK to bathe every once in a while, showers are much more efficient (and if you have a power shower, turn the settings down). By upgrading your old boiler to an A-rated condensing boiler (featuring a programmer, room thermostat and thermostatic radio controls), you’ll soon start to see a reduction in your bill costs. In fact, a detached house could save up to £320 a year, just by switching their old boiler to a new one. If you’re washing your clothes at 40 degrees, turn the temperature down to 30 degrees, and you could save up to £52 a year, as you’re using less energy. However, you’ll need to ensure that you run hotter washes more occasionally, to help keep your washing machine clean. And instead of turning to a tumble dryer, let your clothes dry naturally – whether it’s out on the washing line, or hanging on a maiden. They may take longer to dry, but you’ll be using less energy, and your clothes will smell nicer too. Heat rises, which means a lot of the heat in your home escapes through your roof. That’s why it’s so important to ensure your roof is insulated this winter. It can cut your energy bills by £200, as you won’t feel the need to turn the heating on quite so high, or for so long. Cold draughts coming through cracks and seals can make your home quickly lose its heat – and this is especially true in older homes. Rather than turning your heating up, invest in some draught excluders to stop the cold air from entering your home. They’re cheap to buy, but you’ll soon start to see a difference in temperature – focus on cracks in skirting floors and boards, and if you have an unused chimney, you can block that too. Yes, it can be easy to simply renew your energy policy year after year, but how do you know you’re getting value for your money? Running a simple comparison on websites such as Compare the Market and uSwitch will give you an overview of different energy plans and costs, so you can make sure you’re getting the best value for your money. It’s natural to see an increase in your energy bills over the winter months, due to the weather being colder. But there’s no need to throw money away – these 10 tips will help you to be smarter with your spending, meaning you’ll reduce your energy usage and bills this winter.